National Geographic, Planet or Plastic? An iceberg or a carrier bag? The beautiful image is one of many forcing the viewers to look closer. I had to look twice, did you? Unfortunately this this is the sad reality we are living in, so much plastics ends up in our oceans and damages our planet, animals such as birds and crabs can no longer tell the difference. This beautiful yet effective image Created by Mexican artist Jorge Gamboa has been doing its rounds of the internet for a while now. 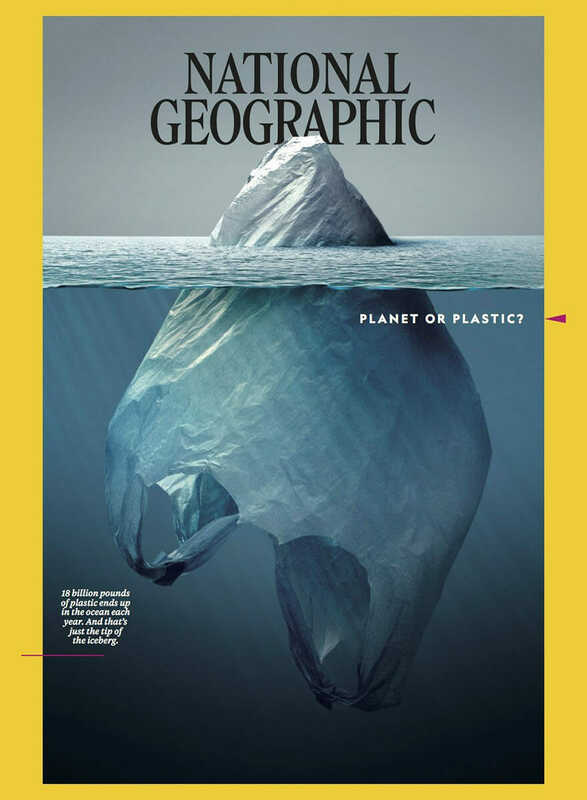 This year, it ended up as the June 2018 cover for National Geographic as they launched a multi-year initiative to try and raise awareness of just how much plastic ends up in our oceans and to try and reduce the use of single-use plastics such as straws. The irony is some people who received the magazine tweeted that they received the magazine wrapped in plastic film and then placed within a plastic bag however National Geographic have recently announced they will be removing all plastic packaging from the sale of their magazines in support of their initiative.